Cover of the 39th Clinic Program Guide, 1993 showing the latest in rebreather prototypes being tested in the New England Aquarium Giant Ocean Tank (photo by Sea Rover Brian Skerry). Changes in the dive business were frequent and rapid as the 20th Century started to near its end. Nitrox and Tri-mix were voodoo words that were not allowed in certain dive publications, and some resorts, including whole Caribbean Islands, even went to the point of banning the technologies for a few years. 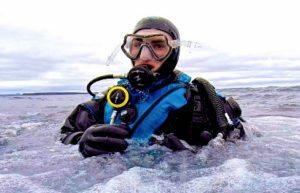 Despite some in the industry’s head-in-the-sand approach, the Sea Rovers continued to blaze trails at the cutting edge of the new realm of what was soon to be called Technical Diving, while also ensuring that all of the traditional aspects of diving were also fully covered, and promoted. And through it all, the Sea Rovers continued to be first, and foremost, a diving club. 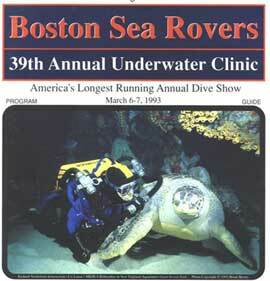 “In 1993 we divers have much history to examine and a great future to anticipate. Our industry salutes the 50th anniversary of the introduction of the Aqualung by Jacques Cousteau. To commemorate this extraordinary history, NIKON will present “50 years of SCUBA” at the Saturday night film festival. We face unprecedented assaults upon the marine environment. Some are deliberate such as the eco-terrorism unleashed by the oil spillage and well burning of the Gulf War which DR. SYLVIA EARLE will describe in the Saturday evening film festival. The day time programs cover other environmental topics such as the long term effects of oil spills. Even a casual act such as throwing a six pack ring into the ocean can trap a sea animal. The New England Aquarium will demonstrate its work in rescuing and preserving sea life. But there is still much beauty in the planet Ocean. During the Saturday night film festival, STAN WATERMAN, the famous underwater cinematographer, will show his latest work on the reefs of Borneo, and DEE SCARR, dedicated naturalist and the Boston Sea Rovers’ Diver of the Year, will delight you with her story about Olivia the Octopus. The day time presentations show marine life and beautiful dive sites in New England, Indonesia, the Solomon Islands, Mexico, Antarctica and the Cocos Islands. The Boston Sea Rovers urge you to support THE NEW ENGLAND AQUARIUM and THE COUSTEAU SOCIETY. Wreck diving and high technology diving are well represented as always, and this year’s rebreather equipment promises to be very interesting. From pirate gold to Columbus, from U boats to the USS New Hampshire, the Boston Sea Rovers have brand new presentations for you. Most scuba divers can enjoy the seas without mishap, but knowing when to dive and not to dive can be important. We have many lectures on diving safety and rescue as well. Please join us in supporting the DIVERS ALERT NETWORK. This year, we have expanded the show to bring you more programming on both Saturday and Sunday. SUNDAY IS KIDS DAY! Children under 12 are admitted free on Sunday and we have a room of programs just for the younger divers. Be sure to see Dee Scarr’s presentation for the kids, and don’t miss the children’s poster coloring contest at the end of the day. Prizes will be given to the best ones. The booths will be open all day Sunday as well as Saturday. Please do visit them for new ideas on dive vacations, equipment, clubs and training. We also have a record number of prizes that will raffled or given away throughout the weekend. The Boston Sea Rovers have more seminars and workshops than ever. These in depth programs are great way of sharpening your diving skills. Please see the program booklet for details. Over the past five plus decades, the Sea Rovers have continued to invite the best and brightest to Boston, to share their discoveries and enthusiasm for the underwater world with our audiences. We look forward to having you become part of our “future history” and hope you and your friends and family join us for many Clinics to come.